With roots in the nineteenth century, Lie theory has since found many and varied applications in mathematics and mathematical physics, to the point where it is now regarded as a classical branch of mathematics in its own right. This graduate text focuses on the study of semisimple Lie algebras, developing the necessary theory along the way. The material covered ranges from basic definitions of Lie groups to the classification of finite-dimensional representations of semisimple Lie algebras. Written in an informal style, this is a contemporary introduction to the subject which emphasizes the main concepts of the proofs and outlines the necessary technical details, allowing the material to be conveyed concisely. 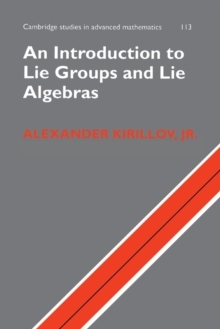 Based on a lecture course given by the author at the State University of New York, Stony Brook, the book includes numerous exercises and worked examples, and is ideal for graduate courses on Lie groups and Lie algebras.